Their Big Day is here! There is no better way to send your good wishes to the happy couple than with a beautiful handmade wedding card design from our Wedding Collection. Our selection of exquisitely designed handmade wedding cards to celebrate a very special occasion, offering mix of glamorous contemporary and beautiful traditional designs. 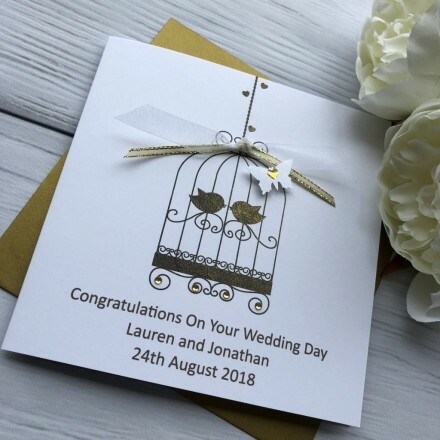 This handmade personalised bird cage birthday card is modern, chic card features an elegant gold and lace bird cage. The image has been embellished with shimmering flowers, diamanties and a white satin bow.